Bo Bech, of restaurant Geist, is a bubbly personality who knows exactly what he wants. 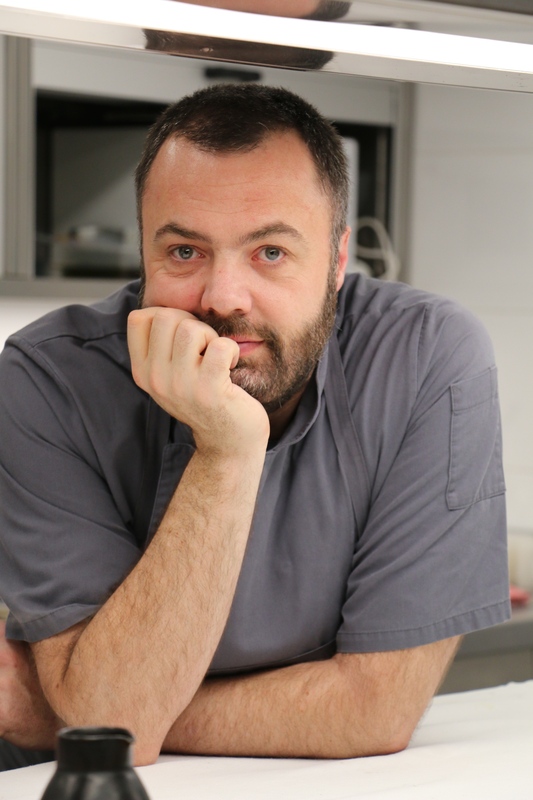 Having made his name in Copenhagen at Restaurant Paustian, where he was awarded a Michelin star, he decided to set up Geist in 2011 because he did not like the way food was going. 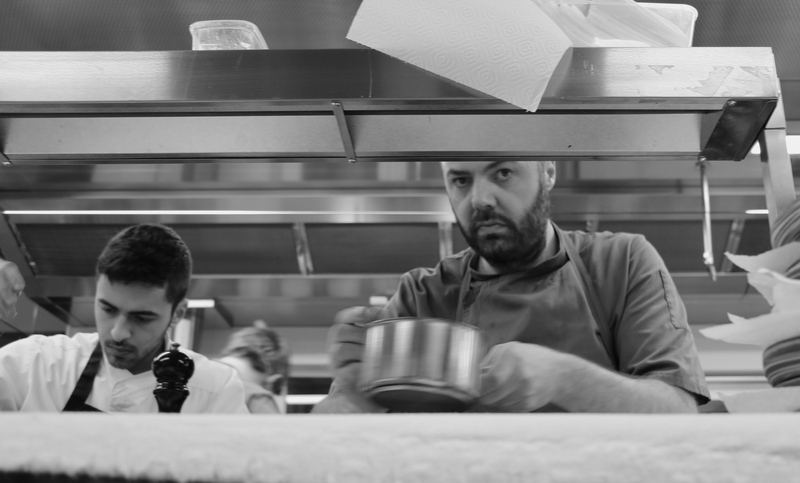 When Sang-Hoon Degeimbre, of two Michelin starred Belgian restaurant L’Air du Temps invited him for a four-hands dinner in Liernu he replied immediately without hesitation. Bech is well-known in Denmark for the Danish answer to Kitchen Nightmares. But he is also a chef who leaves a huge impression. Both Sang-Hoon and Olivier from L’Air du Temps tell us how this restaurant has left a really great impression and they highly recommend that we visit if we are in Copenhagen. 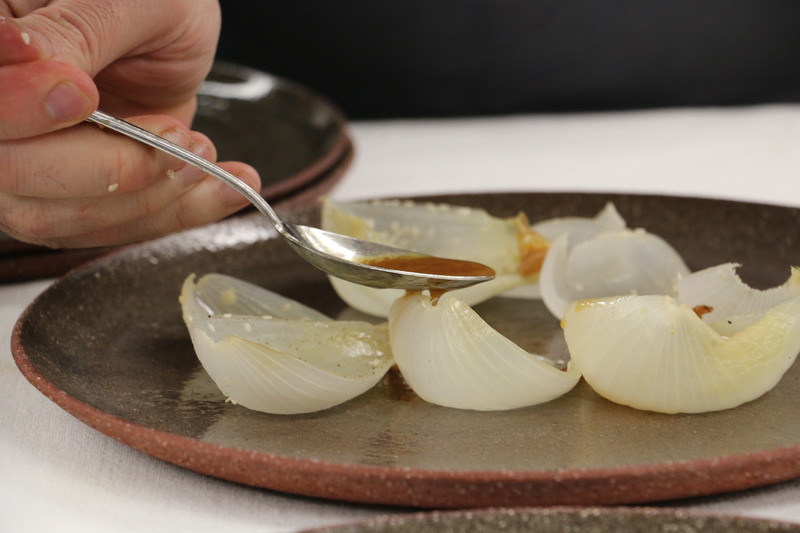 You can understand why from the cooking style of Bo Bech, but also from his philosophy. While he is making the sauce, which is about to accompany what seems like a simple dish but has incredibly complex flavours (the cauliflower with truffle and a white sauce), he asks me to fire the first question. So what’s your philosophy of cooking, I ask him. “It is easier to remember the truth than the lie.” I know exactly what he means but as he starts to explain, he loses sight of the sauce he is preparing and it overflows making a mess. More butter than potatoes in the mashed potatoes dish? In fact he explains at the end of the dinner that in his view food is going in the wrong direction. “I like food to be burning hot. I want guests to enjoy what they are eating without knowing they are eating something complex. That was the philosophy behind the mashed potatoes with caviar. We know caviar always works. Who decides whether caviar or the potato should have a higher standing. I wanted to put the two ingredients together and ask that question. 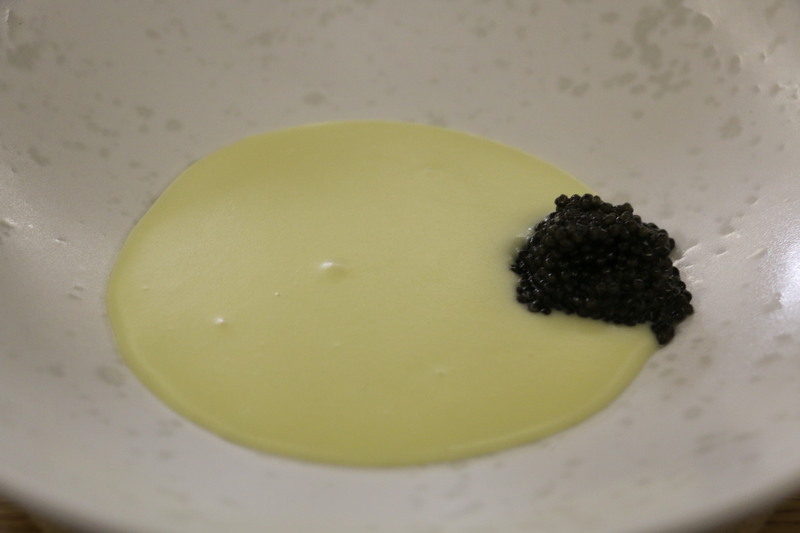 Why cannot a potato, if given love and care not be as good as caviar?” We can attest to the fact that the mashed potato was stunning. “What you do not know is that 70% of that potato was butter,” Bo said with a laugh. So it is best if I wait after the dinner to ask my next question. I ask him why he decided to close a successful Michelin starred restaurant, Paustian, to open Geist. Did you care about the Michelin star? Why did you just decide to close it down? “Food should come from the heart and the brain,” he tells me. “Sometimes we can overcomplicate things so much that we build a wall. When you have your own restaurant, you cook but you tend to build a wall. You tend to act like a mouse on a treadmill. You are running but you do not understand why you are running. One day I was lucky and fortunate to step out of the ring. I had the ability to look and realise that I had achieved my goal,” Bo said. Today, Bo has a new goal and that goal is Geist. “I will work on Geist until I realise that it is complete and then I will try something new.” At Geist, there is no fixed tasting menu as he prefers to offer diners a place where to relax, unwind and savour the moment. The menu consists of light savoury dishes, slightly larger savoury dishes and all things sweet. They recommend that you start by choosing a few dishes and if you have an appetite and a desire for more, you simple order as you go. “There is nothing more powerful than when human beings know what they want” he tells me. When you have an open heart and open eyes you know that the goal has been achieved. Bo Bech is one of those few chefs who did not start cooking from when he was young. He earned a university degree and had started working in the corporate world before he decided to cook. It was only at the age of 24 that he first tried cooking. He started off in Denmark but then set off for a two-year tour abroad. He worked at Michel Roux’s le Gavroche, then Marco Pierre White’s The Restaurant. He then went to Paris to work at Lucas Carton with Senderens and l’Arpege under Passard before returning to Denmark. I ask him whether studying before becoming a chef makes a difference. “Yesterday, Sang-Hoon prepared a mind-blowing dish of an oyster with kiwi. I understand that this dish is 10 years old but I am not the Google person and don’t follow twitter. But I discovered this dish and it was mind-blowing. To be frank, when I discover food, I do not care if the person who cooked it has just started cooking yesterday, whether the dish he created was a stroke of luck or whether he was trained with the masters of the universe. I think that we human beings have a problem. If you take two dogs with a great pedigree and bloodline and they create a super dog, then everyone says that this dog is the most beautiful ever, even if this is not necessarily the case,” Bo said. “There are some who have better options in life but chefs are a bit like boxers. When you are poor, you are a better fighter because you are hungry. Good chefs in the early years are chefs that are hungry. You have an open heart and you have open eyes. It is not the same when you are lazy,” Bo said. So where does he want to go with Geist? “I love stars but it is not cooking for me. For me, a full restaurant is what is important.” You cannot but agree with Bech’s philosophy.